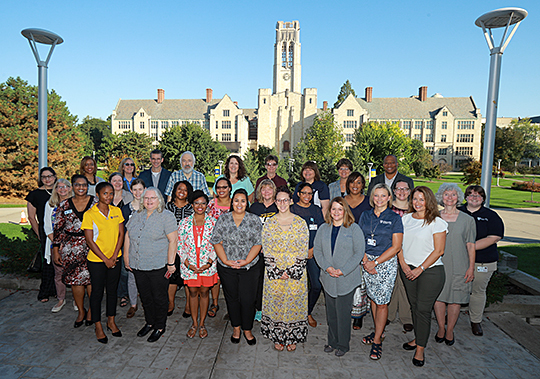 One in three students at The University of Toledo is a first-generation college student, or a student whose parent(s) have not completed a bachelor’s degree. This means that they and their siblings are the first in their family to attend a four-year university to attain a bachelor’s degree. The First-Gen College Student Celebration will take place in the Thompson Student Union Ingman Room from noon to 2 p.m. Thursday, Nov. 8. UT staff and faculty members who are first-generation college graduates posed for a photo last month outside the Thompson Student Union. The First in Family Office, TRIO Student Support Services, Academic Support Services, the Office of Multicultural Student Success, Residence Life, and others will be there to share information about academic and social opportunities to enrich the first-gen experience. “We want students who are first to launch at UT to know that we are here to partner with them. We recognize the pressures of being a first-generation student and want to continue to celebrate and support their accomplishments,” Dr. Willie McKether, vice president for diversity and inclusion, said. For more information, contact Stone at 419.530.3848 or robin.stone@utoledo.edu. This entry was posted on Monday, November 5th, 2018 at 3:23 am and is filed under Alumni, Events, UToday .